This well known postcard has appeared in many publications but the exact location has not been identified. It has been suggested that it might actually be Stoke Prior Salt Works but in the absence of firm information it is reproduced on this page but this does not imply that the MIAC considers it was taken at Covercroft. The Covercroft Works was one of a number of salt works in the town of Droitwich Spa but it is the only one that is known to have had its own railway system. When the Oxford, Worcester and Wolverhampton Railway reached the spa town in 1852 it built a railway station on the west side of the town. The branch to the Covercroft Salt Works started from just north of the station (Droitwich) leaving the goods sidings by a steeply descending curve turning south to the salt works. There has been substantial redevelopment in the area and attempts to find evidence on the ground have proved negative. AVON 0-6-0ST Fox Walker 328 of 1877 (from about 1879 to Salt Union Ltd, 1892). This Fox Walker locomotive came from the Nailsea Coal & Coke Co, West End Colliery, Somerset about 1879. This locomotive was a 'K' class locomotive that had been bought by William Moss & Son in 1878 for use on various railway construction projects and it was given the name 'Kings Cliffe'. William Moss died in 1884 and the locomotive was subsequently sold. It is believed to have arrived at the salt works by 1888. (Ref: Allan C.Baker, Industrial Locomotives of North Staffordshire, IRS). 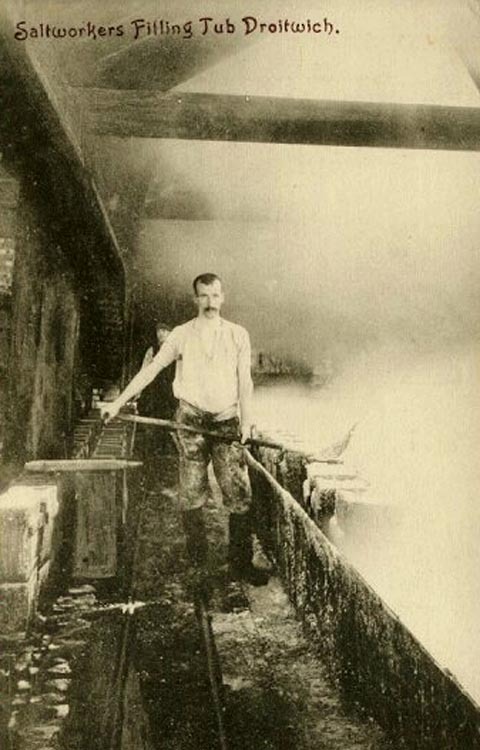 In 1888 the Salt Union Ltd purchased Stoke Prior Salt Works from John Corbett and at some time between then and 1892 also bought the Droitwich Salt Co Ltd. Corbett was by this time the managing director of the Worcestershire Division of the Salt Union Ltd. He took a pro-active approach to competition and eliminated it by the simple expedient of buying them up. The Droitwich Salt Co Ltd continued to trade in its own name after its sale to Salt Union Ltd.